Interesting Facts: Vileplume has a Prussian blue-colored, bipedal body like its pre-evolutions, but has changed in that it now has a much larger "flower" on its head. 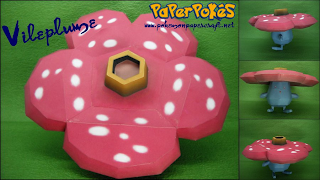 This "flower" is slightly different from Gloom's flower, although it still resembles a rafflesia flower. Vileplume are said to have the largest petals in the world, and they contribute to a large percentage of their height. The size of the petals in relation to the rest of the body make Vileplume very sheltered from the sun, as the petals almost act as a sun visor. NOTES: Build from the plume down, attaching arms and legs as you go. Close at the bottom of the legs. Refer to the pdo if possible, as not all of the 'leaves' of the plume are equal sizes. Vileplume is really awesome. I'm guessing that it can't stand on it's own? Oh, I also have a HUGE question. Because you guys have made so many papercrafts, where do you keep them? Did it fall over in the left picture? left picture was there to show the details of the top of the model. but yeah, it is not very stable so you could use one of our base to glue it on. where mostly keep em on our shelves and throw some out or give some away once it a while when there is too much of them.